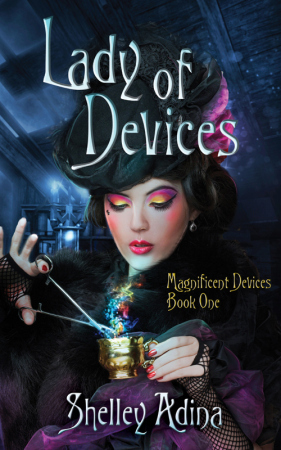 Lady of Devices is Shelley Adina’s first novel in the Magnificent Devices’ series. This steampunk novel is set in an alternate Victorian era. As usual with steampunk novels, steam runs the world. Steam is the hot thing, the Power alternative that will last forever. We meet Lady Trevalyan, a 17-year old with decidedly unconventional interests. No embroidery for this girl. I’ve always liked spunky female characters. Women who dare defy whatever society deems as feminine behavior. Claire is one such lady. When her father shoots himself because of bad investments, the family is left with a lot less money than they had hoped. Claire has to choose between waiting for her mother to find her a husband or try to make a living. She decides to make a living and sets out to explore her possibilities. Claire soon discovers that the “real world” can be dangerous, especially if you are a woman. This is where her spunkiness comes in handy. This girl has grit. She just screams a bit in her head and gets on with whatever she has to do to survive. What can I say, I am a sucker for these kinds of portrayals. There is no denying I want my female characters to be strong. I also want my authors to write in a manner that engages my interest and keeps it. Shelley Adina manages to do just that. Her sentences tie together wonderfully and her images are hilarious. “Claire Trevelyan closed her eyes as a gobbet of reddish-brown foam dripped off the ceiling and landed squarely on the crown of her head. It dribbled past her ears and onto the pristine sailor collar of her middy blouse, and thence, gravity having its inevitable effect, down the blue seersucker of her uniform’s skirt to the floor.” It’s practically so I can feel the goo running down my head.